Mark Eliot Jacobs: Crater Lake Fantasy. Crater Lake Fantasy, subtitled “Another Sky at Our Feet” is a work for orchestra built on the history and natural history of Oregon’s only national park. The composer’s experiences at the park and his imagination also come into play. The work commemorates the 20th anniversary of Dr. Cynthia Hutton's directorship of of the Youth Symphony of Southern Oregon. It was underwritten by the William G. & Ruth T. Evans Fund, Olsrud Family Fund and Campagna Family Fund of The Oregon Community Foundation. In the form of an extended tone poem, the work begins with a cinematic sound image of Mount Mazama, the volcano that exploded 7,000 years ago to form the unique structure of the lake. Mazama was on the order of 12,000 feet in elevation. In comparison, its nearby sister peak Mount Shasta is about 14,000 high. The Klamath people lived in the area at the time and must have witnessed the event. The Mazama prelude is atonal, working with motives that will inform the tonal melodies and harmonies in the rest of the work. 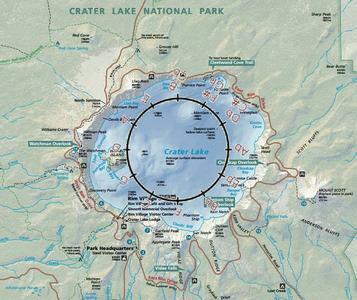 The second “movement” of the work is the first of two depictions of the Rim Drive which encircles the rim of the crater that forms the lake. As a composer, it seems natural to me to think of a journey around the lake in terms of the circle of fifths. The Lodge is at the position of the key of C, Walkman peak and Wizard Island are at D, Phantom Ship is between B-flat and F, etc. The Rim Drive 1 movement moves through three transits of the twelve-step circle of fifths in the form of a rising fifth cord progression: C – G – D – A – E – B – F# - D-flat – A-flat – E-flat – B-flat – F – (C). Each orbit takes place at a different pace. The first two use exclusively bright sounding major seventh chords. The third, a night circuit, uses minor sevenths and major ninths. It is satisfying to think of the atonal chaos of the Mazama movement coalescing into the materials of modern tonal music, much as the material of the old mountain came apart and reformed into the stunning lake of today. Movement three is named after the Watchman peak, but is informed by a recent hike the composer took of Mount Scott on the other side of the lake (key of A-flat!) It is the sort of tune that comes to my mind on a hike, this time in the bluesy Mixolydian mode. Next comes the Phantom Ship. William Gladstone Steel (1854 – 1934), the “father of Crater Lake,” gave evocative names to all of the stunning natural features of the park. Wizard Island and the Phantom Ship are among the best known. Steel believed that the Phantom Rock formation resembled an old tall ship with full rigging plying its way across the water. To the composer, it also resembles a space ship as depicted in films from Star Wars to Buckaroo Bonzai. This is the image portrayed in the piece. The Phantom Ship movement is in the form of a baroque passacaglia using the harmonic language and tempo of the American minimalist movement as exemplified by composers Philip Glass and Steve Reich. Wizard Island comes next with a dramatic incantation from the wizard herself. This gradually evolves into a gentile and nostalgic melody depicting a sentimental and somewhat lonesome magician. The piece concludes with Rim Drive 2. The movement uses similar themes as those in Rim Drive 1 but with a distinctive seven-step circular chord progression: C – A – F – D – B-flat – G – E-flat – (C). The work concludes after a quickening of pace with a dramatic flourish. The work consists of 1,946 quarter-note beats, the depth of Crater Lake at it deepest point in feet.